We buy our trucks because they are supposed to be the easiest and fastest way for us to haul what we need for work or for fun. While our trucks are tough, it seems like we always find a way to damage the paint of dent them up. Luckily, there is a solution! At Line-X Sioux Falls, we are an authorized Line-X dealer that has the experience, skills, and tools needed to help you protect your truck using the incredible Line-X formula! Read on to learn about the benefits of these incredible spray-in bed liners and coatings and then give us a call for a free estimate that covers the Line-X products as well as any truck accessories that you want, including nerf bars, grille guards, tonneau covers, and a whole lot more! Line-X is probably best known for their spray-in bed liners, and for good reason! These bed liners are applied by the authorized technicians at Line-X Sioux Falls to perfectly contour to your truck bed. The Line-X formula is incredibly strong and will help protect your truck from scrapes, dents, and chips. In addition to offering unmatched protection, Line-X products look spectacular, too! You don’t have to baby your truck to avoid scratching the bed — call us and schedule an appointment for a bed liner that will keep your truck as functional as possible while still looking pristine. While your bed is the surface most likely to get scraped up or damaged due to everyday use, there are many other parts of your SUV or truck that are susceptible to damage. Line-X can be applied to almost any surface of your vehicle to help prevent scratches, dings, dents, and rust! While most of us don’t spend a lot of time looking at our wheel wells, they can end up taking a fair amount of abuse over the years. With rocks, rain, mud, and all of the other crud we drive through, your wheel wells are a necessary blockade that stops all of these contaminants from reaching many important components on your truck. Modern wheel wells are most often made out of plastic so, even if they are tough, they aren’t always tough enough. Line-X protective coating will help stop damage before it starts! Some of us work or play in conditions that aren’t ideal for our vehicles. If your truck or SUV spends a lot of time in deep mud or water, you might be surprised to learn that your undercarriage is at risk of rusting. While modern trucks are built to withstand a lot, there are some conditions that even the strongest steels can’t weather. That’s where Line-X can help! Talk to us about having your undercarriage sprayed in order to prevent rust! We never realize the parts of our trucks that can be damaged until it happens. The bottom of our doors are a perfect example. While they seem like they would be high enough to avoid certain kinds of damage, they are at the perfect height for other kinds of damage. A coat of Line-X can help protect your paint and prevent scratches, dings, and dents! 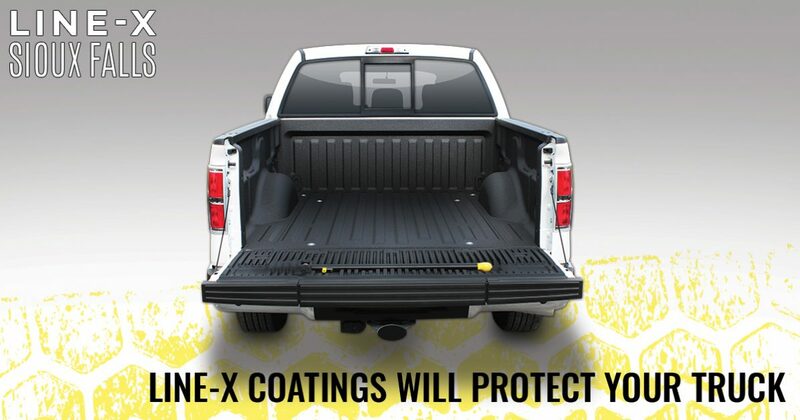 Contact us at Line-X Sioux Falls today to learn more about Line-X coatings and other truck accessories! We would love to help you defend your truck from everything waiting to scratch up your paint or dent a panel. Whether you need a bed liner or you want to protect your vehicle from hood to tailgate, we can make it possible with our protective sprays and our truck accessories!